Dutch minimalist Louis Andriessen is a much-influential figure in his native country, both as a composer and as a teacher at the Royal Conservatory in The Hague. 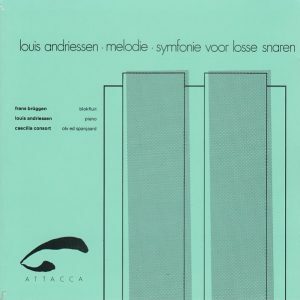 The CD gathers two entirely different works, Melodie for recorder and piano from 1974 (played by Frans Brüggen and the composer at the piano) and Symphony for Open Strings from 1978. 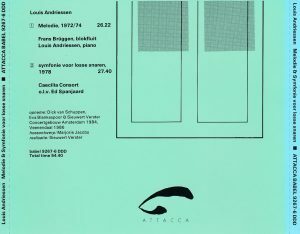 The symphony was already published on CD by Attacca, Attacca Babel 8844-2, with works for string orchestra by Willem Frederik Bon, Tristan Keuris, Leo Samama and Peter Schat, all played by the Caecilia Consort. Attacca must be lauded for doing the necessary to avoid subjecting the record collector to the irksome obligation of duplication: all the rest was reissued on Attacca Babel 8952-5, with the addition of Glauco Cataldo’s Concerto for violin and string orchestra. These Attacca CDs were released at the end of the 1980s (the first two digits indicate the year of release) and came with no barcodes, which makes them sometimes hard to find on commercial websites. In the very terse liner notes, Andriessen explains that one day he heard through his open window a kid next door learning a baroque piece for recorder, playing it very slowly, with his mom accompanying him by playing the same melody at the piano, so he “decided to compose what [he] heard”. The results is a very simple melody, but the fascination effect derives from it being played indeed very slowly, not always entirely in unison but close, likening it to some wistful Japanse ritual music. Because the piano strikes only single separated tones in the high reigsters, with very little resonance of each note, it sounds more like an exotic percussion instrument than an actual piano.There are a few quarter-tone glissandos and there’s one dramatic moment, starting at 15:34, a big crescenso on an ostinato repeated note of the piano with resonance pedal depressed, followed by a crashing chord, and then the mood returns to the wistfully ritualistic. Running 26+ minutes, it seems long, although the length is, I recognize, an element of the fascination effect. In Symphony for Open Strings, Andriessen has twelve strings all tuned differently and playing only on the four open strings. The sonic results is extremely mysterious and fascinating, occasionally very powerful and dramatic. The music is not “repetitive minimalist” in the manner of Reich-Glass-Adams, it is neither entirely “minimalist” (although some passages do sound relatively minimal) nor “repetitive” (although there are a few repetitive structures). It evokes more, occasionally, the early String Quartet in Four Parts of John Cage or his ballet The Seasons. With hindsight Andriessen, writing in 1986, says that it evokes “a little trip on the water on a summer afternoon, while the waves gently slap against the boat in a rapid succession, whereas the boat seems to be quite still”. Well, okay for the aquatic metaphor, but then it would be the waters of the river Styx leading the dead to their last repose, music for Jim Jarmush’s Dead Man. TT 54 minutes, this is worth the exploration.